Start discovering your next destination, Antalya, by reading about the attractions, places of interest, shopping and dining options as well with excursions. The pearl of the Mediterranean, Antalya has been keeping its place among the top destinations of those who are craving for sunshine, no matter which time of the year that is. The city, both with its historical roots and the natural treasures, goes on fascinating all the travelers, while promising a wide range of attractions to choose from. Antalya is one of the biggest cities in Turkey with a population of almost 2 million people. The popularity the city has gained during the last 10 years ended up with a lot of investments in the city. These eventually have turned Antalya into one of the most modern places within the country borders. When we add the Mediterranean sun that barely disappears throughout the year, it becomes crystal clear why the city is visited by 10.2 million people each year. Once inhabited by the Romans, the city still preserves its historical look with an adequate amount of modernity. With the help of the beautiful climate, Antalya is one of the greenest cities in Turkey. 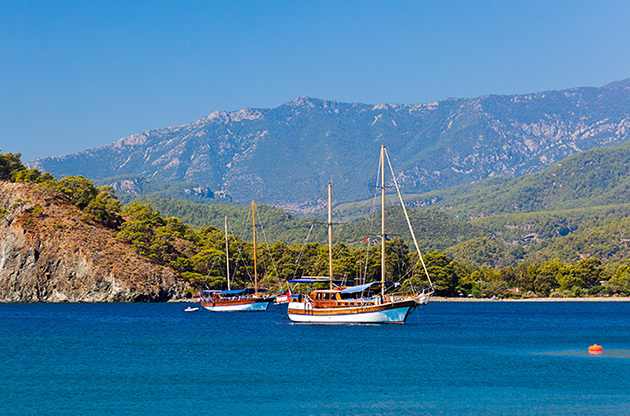 Your trip may be accompanied by the smell of orange trees and the warm hand of the sun, while you are discovering this ‘most beautiful place on Earth’ according to Mustafa Kemal Ataturk, the founder of the Turkish Republic. The city is also popular among the local tourists, especially during the summer months. That’s why the streets, parks, cafes and pubs are always filled with both Turkish and foreigner people who enjoy the best examples of the cuisine or enjoy the one of a kind beaches scattered along the coast. Antalya, although mostly known as a beach paradise, offers a holiday that suits all types of interests. As the city is compact, you will have the chance to make the most out of it on foot. While you are learning more about the culture of Antalya, enjoying the sea, trying out the local cuisine and marking your holiday as one of the best ones ever, the sun will always be smiling to you above. Antalya is located on the southwestern coast of Turkey, on Turkish Rivera. Antalya has got one of the busiest international airport, and it is located on 13 km northeast of the city center. The official website of the airport provides the necessary information regarding the transportation to/from the airport. If you need to travel to towns around Antalya once you arrive, especially Side, Alanya or Kemer, there are shuttle services available from the airport. How to get around in Antalya? As mentioned before, Antalya is a compact city. Most of the city’s attractions and major points of interest can be reached on foot. However, if you prefer the public transportation, city’s little buses, nostalgic tram and cabs are at your service. When it comes to Antalya’s attractions, a long list that doesn’t have an end welcomes us. Anything you may desire during a trip that is filled with sunshine and the joy of discovery is within reach in this beautiful city. As Antalya has been home to the Romans once upon a time, the city center is filled with sculptures and ruins they left. A day tour in the city must include a stop in the Hadrian Gate, which is now located at the beginning of Isiklar Street, one of the busiest streets in town. You can follow the way under the gate to see the Old City, a place filled with old houses, nice cafes, pubs, and with Antalya’s marina at the shore. Yivli Minare, or Fluted Minaret in English, the Clock Tower, Broken Minaret Mosque, Hidirlik Tower and M.Kemal Ataturk’s house in which he used to stay while visiting the city are among the places that must be seen in Antalya. History lovers shouldn’t miss Antalya Museum, the ancient Graco-Roman city Aspendos (50 minutes from the city center) and Phaselis. As in all the city’s the world which are invaded by visitors throughout the year, Antalya offers an extensive amount of shopping options. Isiklar Street used to be one of the most popular streets in the city and most of the stores of big branches were located there. As the big malls are preferred by the locals more, the street now is home to smaller boutiques and shops. If you are after handmade, more traditional items, then head directly to Old Town (Kaleici in Turkish), you will find anything you need. If you want to take back something unique to this shiny city, then I would recommend you go for Antalya’s jams, especially the bitter orange one. If what you are looking for is more comfortable shopping, Terracity (a huge mall located in Lara area) is the place to go. If you are closer to the other side of city, then head to Migros, which is the equivalent. You know, Turkish cuisine is famous worldwide as it has some of the most delicious dishes in the world. You are even luckier to be visiting Antalya, as the local cuisine is diverse and encompasses one of a kind dishes that cannot be tastes anywhere else in Turkey. You will come across a lot of cafes and restaurants in Antalya, most of them will take care of you better than you imagined. For an upper class Turkish restaurant experience, I’d recommend 7 Mehmet, which is by far the best restaurant within the city limits. If sea food is in your mind when you are so close to the Mediterranean, Lara Balik Evi (Lara Fish House) might be a good choice. If want to try something special to region, you should give a try to ‘Piyaz’, which is a bean dish with tahini sauce. You can try it in ‘Piyazci Ahmet’, located in Gulluk district in the city center. This type of Piyaz cannot be found anywhere else but in Antalya. Most of Antalya’s nightlife is located in the Old City. You can choose from stylish pubs and cafes, and enjoy your drink while listening to nice guitar tunes. However, if you want a more dancing style place, these are located in Dedeman district of the city. Who said it’s not possible both to swim and ski in the same day? Well, the one apparently didn’t know about Antalya. The mountain Saklikent, which is approximately an hour from city center make skiing possible almost 7 months of the year. Make sure to check the updated snow fall amount before you set out, though. It is always possible to enjoy the shades of Mediterranean by renting a boat from Marina, or join a daily tour that starts in the morning. The food and drinks are usually included in the price. Prepare yourself for a day just for feeling the sun on your skin and swimming. It is not easy for a city to be favorite place both for foreign visitors and local ones and keep on meeting the needs of them at such a high level, but Antalya is a professional when it comes to that. Every year, not only people who travel to the city for leisure tourism but also a lot more come to attend international congresses, conferences, symposiums, seminars, trade shows and fairs. Antalya’s heaven-like natural beauty, historical richness and attractions turn the event trip into an unforgettable expedition.